Of course the sliding windows are the least of this car's foibles. The G-Wiz jumps around like a jackrabbit over bumps and potholes, has a handbrake that feels as solid and well put together as a cocktail umbrella, and offers a feeling of luxury on a par with a pedalo. If you buy one, you may well wonder where your nine grand went. It certainly didn't go on providing a commodious interior because there isn't one. Front seat passengers sit closer than adolescent lovers, and the driver can happily adjust the passenger door mirror simply by reaching across the car. But there are upsides, of course, or we wouldn't be writing this and no-one would ever have bought a G-Wiz. Item number one on the tick list is that the G-Wiz is great fun. Fun like driving a dodgem – or, indeed, like riding any other fairground ride of questionable safety. You get in, strap in, hope none of the bolts come undone, and emerge at the other end wearing a silly grin. The new model is safer than the old one, and the new curved screen gives a bit more room between forehead and windscreen, although the rear-view mirror still feels close enough to poke you in the eye. And the new car is marginally faster than the old AC model. Fast is relative, of course, but the G-Wiz i feels quite quick enough for urban roads. It will hit 45mph eagerly enough and can indeed reach the claimed 50mph. Thankfully the new front disc brakes are up to the job of stopping from such speeds, but the G-Wiz is not really happy at the top end of its rapidity range. Like re-entry from orbit, max-power runs are a loud, vibratory test of mettle that tend to be accompanied by crossed fingers and murmured prayers. There's even a go-faster mode on the rotary, dash-mounted gear selector, which provides extra acceleration rather than additional top speed. It offers reassurance when a quick getaway is needed. No doubt something would melt if you drove around in this mode all of the time, and most of the time it's not necessary. 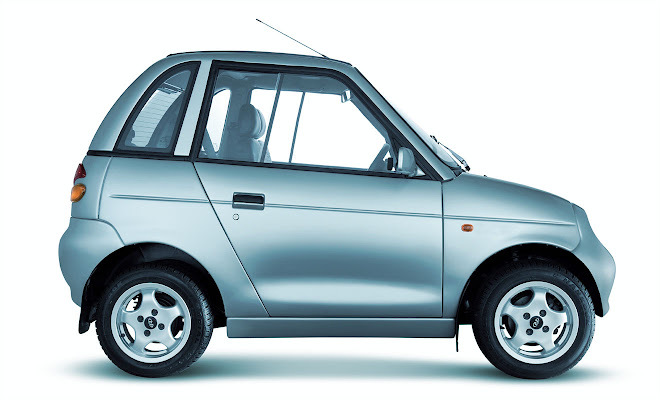 The new “i” model isn't radically different from all the G-Wizzes that have gone before – it still has laughable back seats, laughable looks, gawky proportions, nippy steering, a tiny turning circle, lead-acid batteries and limited (40-odd mile) range. But it is improved. And it is a lot better than taking the bus.